If yoga helps a Christian man to walk for the first time in thirty-three years, does his newfound strength come from God or the Devil? That is the question tearing apart an Evangelical church in Las Vegas. So, when John Taylor prayed earnestly that a similar miracle might befall his fellow church member, Mike Persi, he prayed in faith, believing, and then waited. Mike had been wheelchair bound for over three decades, ever since an accident at age 27 left him unable to walk or to speak without stuttering. The odds were long against Mike getting back on his feet. But one week later, an acquaintance who didn’t know about the prayer sent John’s wife a video in which a man with similar injuries regained his ability to walk through intensive yoga therapy. John took it as a sign. So did Mike. So did born-again Christian yoga instructor, Mitch Menik, who even offered to take Mike into his own home during a course of intensive treatment. When Mike took his first wobbly but unassisted steps, all involved were thrilled and thanked God for a miracle that to their minds was modeled on the ministry of Jesus. But not everyone in Mike and John’s Abundant Living Las Vegas congregation felt the same. When friends set up a GoFundMe page to help Mitch cover income lost during the time he was working with Mike, most parishioners refused to contribute. And when Abundant Living’s pastor blessed the therapy, members (and money) poured out of the church. ’Your body will most likely become much more flexible by doing yoga, and so will your mind [Yoga Journal].’ As one can see, Yoga is more than just a physical exercise. We as Christians do not want to make our mind more flexible. We do not want to leave our mind open to false teaching. According to Pentecostal and related theologies, all around us invisible supernatural powers are waging a cosmic war between good and evil, with the literal forces of Satan aligned against the host of God. As this battle plays out, each of us is on one side or the other, and only great vigilance can prevent Christians from being seduced by false prophets or demonic powers. In this view, the Hindu gods are literally demons, which makes spiritual pluralism dangerous and bad. In India, Hindu villagers have voiced outrage when children come home from missionary schools—sometimes the only schools around with books and paper—frightened because teachers have said that their parents and aunts and uncles worship evil demons. As harmful as this might be to parent-child relationships, the missionaries genuinely believe they are doing the right thing. In the words of Pat Robertson, “Hinduism and many of the occult activities that come out of the Orient are inspired by demons and demon worship…There’s this concept that all religions are the same and all are good. That is not true. The worship of the Devil is not good.” Yoga, like séances and Ouija boards, can create small cracks in your spiritual defenses through with a demon can take possession of your soul. This is the kind of fear-based Christianity that boycotted Harry Potter movies and seeks to keep fantasy books out of children’s libraries. That is because this worldview takes the idea of sorcery quite seriously. Human development consultant Marlene Winell coined the term Religious Trauma Syndrome to describe the experience of many who have been wounded by authoritarian, fear-based forms of faith. Winell was raised by Pentecostal Assemblies of God missionaries, and lays out the Pentecostal worldview succinctly, along with psychological harms it can cause. This month, Mike Shreve ministries, an outspoken opponent of yoga will host a faith healing conference in Tennessee featuring “seasoned minister of the Gospel” Richard Madison who “was literally ‘raised from the dead,’ confirmed by a medical technician.” In rural Africa, far from modern medical science, unaccountable American missionaries from Pentecostal denominations host faith healing rallies and frequently claim miraculous cures that include raising the dead. In a world filled with magic and peopled with unseen powers, not unlike the Iron Age context of the Bible writers, it only makes sense to be wary of miracle cures from suspect sources (who may be viewed as competitors as well as practitioners of the dark arts). 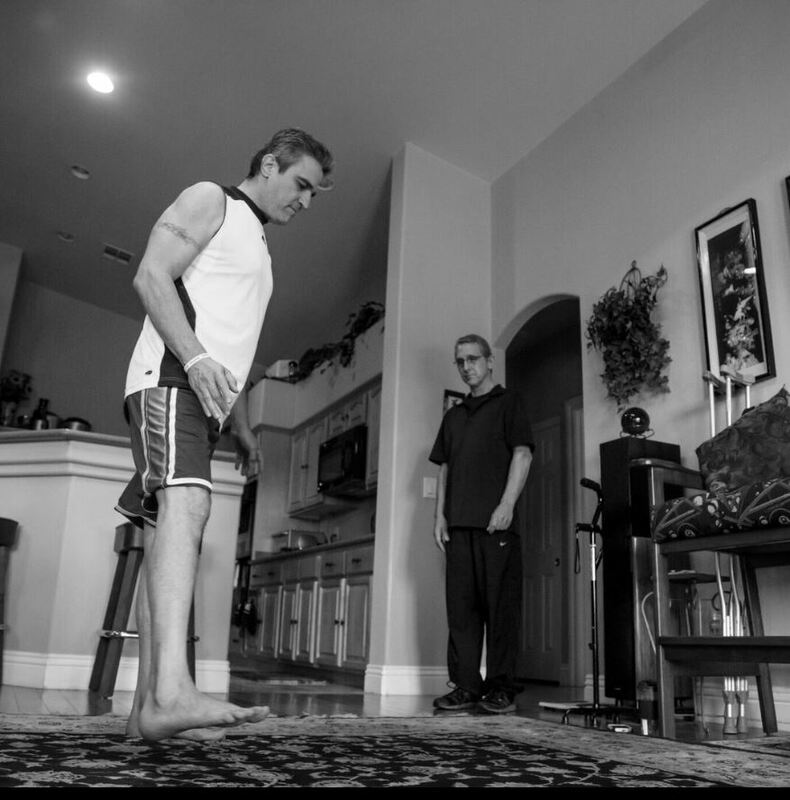 From where Mitch Menik sits, there’s nothing demonic about the fact that Mike can now walk across a room unassisted, although he too gives thanks to God for the miracle. The accomplishment has been attained through a rigorous course of exercise that taps inner strength to build outer strength. The regime draws on not only Yoga but Tai Chi, Ki Gong, and a diet of nutrient rich home-cooked meals provided by Mitch’s partner, Than. Mike has come this far not only by the grace of God but by setting small, incremental goals and then working to beat each milestone. As of Monday, May 11, his record was 274 steps total, including 65 in a row without assistance. On Mother’s Day, Perry preached about Matthew’s story in which a gentile mother comes to Jesus seeking healing for her daughter. At first, Jesus turns her away, saying that his ministry is to the house of Israel. But she keeps asking, and he relents. Perry interprets the story for his congregation: “The real message of this story is the tenacity of this mother’s faith. Don’t take no for an answer even if the no comes from Jesus. . . . Faith stays after it, even in the face of adversity.” Is Perry’s sermon an affirmation of Mike and Mitch’s remarkable feat or an exhortation to himself and the remaining members of his congregation? Perhaps both. On May 24, Mike hopes to walk into church on his own two legs, with his friends at his side, for the first time in thirty years. He is so proud and grateful that he’s hoping the whole Las Vegas news community turns out to record the event. 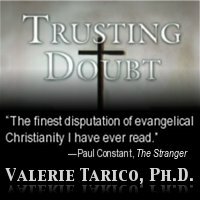 Gallery | This entry was posted in Musings & Rants: Christianity and tagged fundamentalism, spiritual warfare. Bookmark the permalink. While it’s nice that the man is walking, color me suspicious. Anything that hints of Pat Robertson, and the Assemblies of God as well. I’ll just continue being the happy heathen I’ve always been. I had formerly engaged Buddhism in my sojourning and liked its meditative principles. I found it to be less a religion than a practice—like an exercise regimen for the mind & body. So I communicated with the Dhamma Brothers administrator after I first saw the film. Having argued their “appeal” logically, reasonably, the Dhamma Brothers still had their innovative & successful program closed. Hmm. Now there’s something to contemplate in a full Lotus postion. Although I refer to myself as being formed in cultural Christianity but, now by choice, a mindful secular humanist. Still…I’ve always liked Buddhist meditative practice. Very good piece—thanx. Thanks, Lary. I shared this in the comment thread at AlterNet (with a hat tip to you). This is just an e-mail trigger for replies. I forgot to check it after I hit “post comment”. This would be hilarious if not for those who take this superstition seriously. If God took away use of my legs and Satan restored them…where do I enlist? What a wonderful miracle brought through the power prayer and the exercise and movement used in yoga which the body thrives on to loosen up welded old bones and tiightly hinged muscles against bone that has not been used for decades that is totally weakend by sitting and lying. Although yoga is practised and derived from hindus why can’t we just use the good from it and discard the portion we don’t believe in just as Mitch the born again christian performing works from yoga and at the same time thanking God for it. See it as excercise. I always preferred to go to the practical side of body healing more than choosing the intake of chemicals. God is the creator, the artist the supplier of all things and functions. We have His spirit to keep us on the right path. I go out early morning with my yoga friends and do our yoga on the beach. No ritual stuff. Just excercise. When I’m hurting I allow the yoga master to put those heated stones on my spinal chord as it removes the pain and the injury and shifts the toxins away so they can be released from the body so I can function and be supple. I praise God and thank the Lord for yoga. BUT I do not believe in the rest of Hindu beliefs and prractices as God made the stones the devil didn’t. He created us. Gave us brains. What we discover in time by using, stone, herbs, water, sand, precious rock pieces (also used to make juwellery) also to make our clothing from cottontree, furniture from wood, iron from the ground etc. All this is from God. So let us as christians not be distracted. Because yoga was used on mike performed by mitch does not make the pastor look any lessor which is Gods instrument as well. We are all instruments so let’s use the good that comes out of the bad to Gods glory the creator of ALL things including those Hindus who will not acknowledge Him. In the last time I have seen so much good in my jewish friends as well as in my moslem friends. We must not judge as they too have good. All religions all nations have the opportunity to welcome Gods spirit in their lives or to surpress it. Its our choice. But it doesn’t matter how far away we dwell God promises never to forsake or to leave us therefore He will keep putting in His power where He sees fit. Mitch saw the use of the Yoga as a beneifit an accet to the body of mankind and studied it and now using it to Gods glory as He is the creator of all good things which we benifit from mind,body and soul. We must not condemn the person inthe Hinduism or moslem or whatever religion they are just continuing with what they were taught from little. So many have come to Jesus. The jew will come also but will bring along with him his good things he was taught along with him and discard the negative being to now believe that Jesus is the son of God and was raised from the dead. I we can learn from him again many a thing as I have been learning from my fellow jewish friends like the closeness they have in the religion towards each other. They stand up for each other and where the one family is in need they all team up and support and give. Create an income by giving someone work in their bussiness. The kids are taught business and how to work with money from tiny. We do not see this as important we mock them for that rather than to see that this is why they flourish and live abundantly and don’t have to beg God for prosperity so the moslems are very similar but we have the Spirit of God to guide us so we can learn from all religions prcticed. God in time will have the perfect Church and that will be at the end. So let’s not condem but be open to accept and see Gods hand anywhere, any place and any time no matter where and except but be very cautious and not allow satin to even have a tiny little gap to get in. We must always be dressed in full armour. We christians don’t have to live like the Amish or many religions do so they don’t get side tracted by the rest of mankind. We have the Spirit to Judge for us we are strong in mind and power and can define what is good and keep it and use it and discard that which is from evil without condeming a person but see it also as the work of God brought to us through people performing acult. Mitch did that. He knew through his wisdom gained by his experience that the bones needed those movements and exercise to get going after decades of sitting but he is not a Hindu. Praise God !!!! And bless Mitch for being Gods servant and vessel. Let’s never judge but be open to learn from each other through Gods wonderful gift of the Spirit He especially left for us when Jesus assended to be on His right hand so we will not be left alone. But be filled with what is part of Him to be guided with the truth always and with everything and anything no matter how small. I feel in my Spirit that when I perform Yoga movements its good for my body and my mind and what’s good for those is good for the soul too as it creatates positiveness meaning a healthy brain/mind which only can come from God. But I will never give up my Lord God my Saviour to worship any idol. Have a wonderfull day Vivian an God Bless you abundantly on this site in the work you doing. (Hugs) Marlene Brandon. Here’s a tip that will save you countless hours and untold irritation: Copy the text and paste it into a new word processor or text editor document. The word count will be instantly revealed. Actually, that’s how I wound up doing it. I tried a combination of LSD (to alleviate boredom), amphetamines (to provide energy and focus), and a few shots of brandy to take the edge off, but couldn’t find the right balance. After six tries, I got six different answers, so I gave up and let Microsoft Word do the counting. Forgot to indicate both points before sending off my mail as I would love to be part of it always. Regards marlene. Although it doesn’t relate directly to this article, I think that you’ve hit the nail on the head as to why evangelicals are so resistant to e.g. evolution or climate science. They regard them as the teaching of “false prophets”, and don’t wish to open their minds to these “false teachings”. Great expose. Proves one salient point: nonsense knows no boundaries. There’s really nothing wrong with Yoga. My wife does Yoga and she is more’Christian’ than me. Yoga helps improve one’s health, restores one’s vitality, makes a person more clear-headed and rejuvenates his or her thinking processes, But then the fundamentalists are creating a Yoga scare in America particularly by guys like Pat Robertson and other fundamentalist preachers. I think he is more influenced by the Devil than by the God he supposedly follows considering the kind of hate messages and stupid ideas he rants every evening on TV. I hope Christians in America, especially evangelicals, come out of their narrow, dark shells and keep their minds open to richer, better and more progressive ideas.They need not necessarily believe in or follow the Hindu religion by practicing Yoga. If this man was healed then praise be to God. I simply cannot understand the irrational fear that some of my fellow Christian brothers and sisters have. All healing is of God – whether that’s through the body’s natural process, or through the assistance of prayer, western medicine, eastern healing arts, new agey energy work, wiccan herbal medicines, medical marijuana, and/or through yoga. Namaste y’all! – Rev. Roger Wolsey, United Methodist pastor and yogi. Thank you. I shared this in the comment thread at AlterNet as well. With the “Spiritual Correctness” of modern evangelicalism opening the door to heretical fads like “Christian Yoga,” it was only a matter of time for the enemy display the fullness of his talents. Modern evangelicalism has refused to accept the New Testament spiritual warfare worldview taught by our Lord Jesus. The church has succumbed to the pantheistic and pluralistic world view where if it is spiritual, and apparently good things happen, it must be of God. The church must move beyond its Spiritually Correct worldview which acknowledges the miracles and spiritual warfare in New Testament times but functionally treats its belief in the supernatural as though it were reminiscent of a mere mythical legend for today. I thought you might be interested in a follow up on Miracle Mike. Even the people who helped him initially have abandoned him. I’ve been helping him get the word out. Please take a look at his site and share his story.